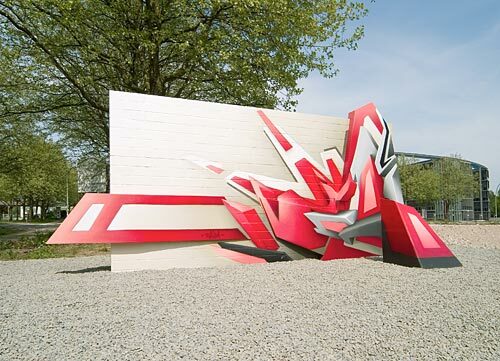 The German graffiti artist DAIM doesn't just bomb walls -- he creates graphics, illustrations, commissions, and exhibits in galleries around the world. He started at 17 "...just going out and doing some stuff." After his parents and teachers found out he was doing graffiti art, they gave him a wall at a youth club and at school so that he wasn't getting into trouble with the authorities. It wasn't long after that that he was able to start using his spray can to make a living. My [early] influence comes form the early Hamburg kings, like Skener and Jase, but also Loomit and the FBI Crew. 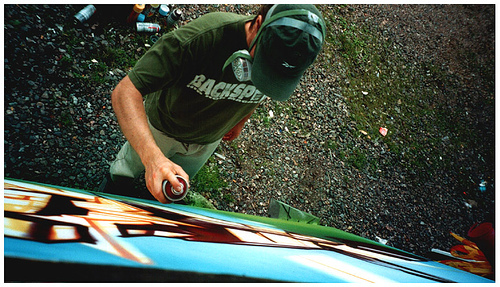 Not really from American graffiti, because my first book was a Munich graffiti book, not Spraycan Art of Subway Art. Wild Style and Style Wars I saw years later, too. I think that's why my style is not so typical New York boogie-down whatever. It's more like "lets try to do something new and push it". I was really influenced by Dali and MC Escher and Van Gogh. I never studied Art History or anything. I think that artists just have to make their own path. I've traveled a lot and I think that instead of taking pieces of history, artists have to just go off on their own and make their own history. 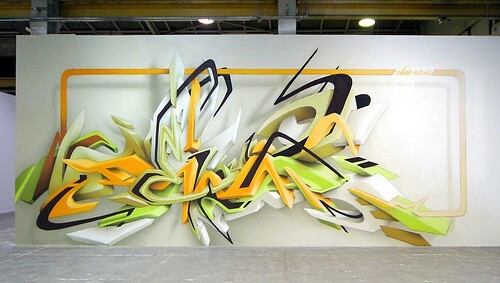 DAIM has a Google Map of his work across the globe, too! Awesome.